Democrats say there’s nothing Republican lawmakers can say to convince them changes in public employee pension aren’t just around the corner if Republicans retain control of the governor’s office and state legislature. Danny Homan is president of AFSCME Council 61 which represents the greatest share of state workers who are union members — workers who get a pension from the Iowa Public Employees Retirement System or IPERS. 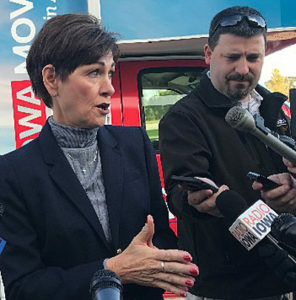 Republican Governor Kim Reynolds told reporters this morning there have been in the past and will continue to be routine adjustments, to ensure the solvency of the pension system. Iowa Democratic Party chairman Troy Price said during an afternoon news conference that Reynolds has sent “mixed messages” by talking about “hybrid or different” pensions like a 401k style option for future workers, then recently saying there will be no changes for current or future IPERS beneficiaries. “We’ve heard from our governor on this issue and it further showcases her willingness to say or do anything to win this election, even if it means contradicting her previous statements,” Price said. Reynolds said Democrats are trying to scare people. 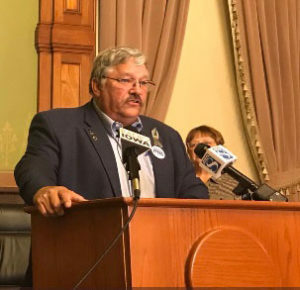 The top Republican in the Iowa House says there have been no charges to IPERS and Republicans in the House have “no secret plans to change IPERS for current employees or new hires.” A key Republican in the Iowa Senate proposed switching state employees hired after July 1st of 2019 to a 401k, but his proposal went nowhere in the 2018 Iowa legislative session. One out of every 10 Iowans are current or retired public employees who are getting or will get an IPERS pension.